5- No doubt, Therefore It goes viral within months probably. 6- For example more promotion > more share > more traffic > more money also. 9 - The built-in Ad Spots , adsense and others ads. 10- Most noteworthy - Store everything to database. 1)Show all the tests which has been added by admin (On home) and buttons for privacy/home , etc..
3) Share test button (after generating result). 2) Add test: upload picture, name of the test and description of the test. 3) Add the result: name of the result, description,picture, check box to select Image types - square and round , Drag and Drop function to set user(s) image on picture. 5) You can check , delete and edit test easily . Hence you can add as much as results to any quiz also. 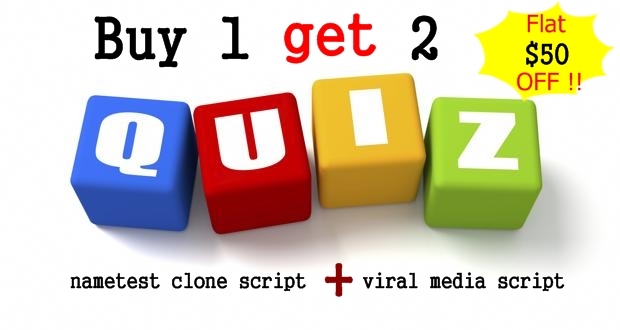 Buy nametest clone script, heroquizz clone script, meaww script ,9 gag clone script- BUY 1 GET 2 is ranked 5 out of 5. Based on 2 user reviews.